Tibet is an area in the Republic of China that has been the point of conflict for many years in China. While China believes that Tibet has been under Chinese rule for many centuries, Tibetans claim that they declared itself an independent republic in 1912. 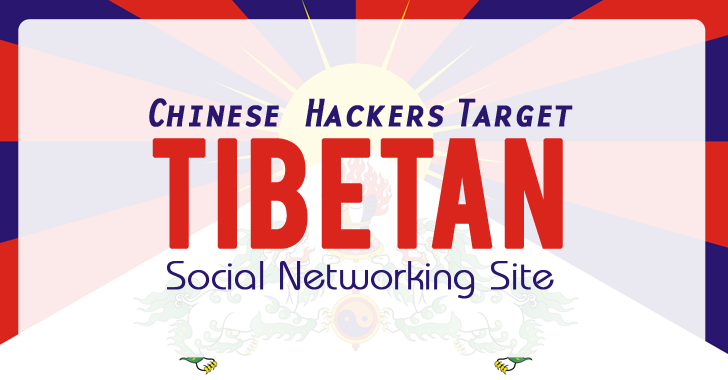 Chinese hackers are believed to have targeted a Tibetan only social networking site, unitib.com (United Tibet) as Beijing views the platform as a threat promoting free Tibet movement. Tashi, a member of the technical team at Unitib told The Hacker News that "the targeted attack was done using a fairly large botnet and lasted over 10 days. Over 8000 IP addresses were identified in the attack that used an automated script to create more than 20,000 fake accounts and tried to DDoS the platform." A Botnet (also called a 'Zombie Army') is a large number of Internet computers that, although their owners aren't aware of it, have been set up to forward transmissions (including viruses or spam) to other computers on the Internet. "Previously, we only faced challenges where Chinese hackers would create a small number of fake accounts and post pro-Chinese and anti-Tibet articles - but this attack was too large for our team to handle" added Tashi. The social networking website, founded by exiled Tibetans in Dharamshala, India, rose to popularity last year after it sponsored over 35 football matches by the Tibetan National Sports Association and chose Tenzin Dolma, Miss Tibet 2007 as its brand ambassador. The Chinese government has interfered previously in Miss Tibet Pageants, pressuring international directors to name Miss Tibet as "Miss Tibet-China". Miss Tibet 2007 Tenzin Dolma was asked to wear such a sash in the Philippines at the last minute, but she refused and was allowed to go ahead with the Miss Tibet sash. "We plan to increase various security measures on the website, including stronger captcha as we consider this attack to be served as a warning for even larger attacks by China in future," Unitib team told us. China has been autocratic when it comes to other cultures. Tibet has its own culture, language and a political system that is not identified by the Chinese. Even though legally Tibet is an independent state, China’s denial of free speech and violations of human rights is the primary reason for the Tibetan independence movement. After the attack, the founders of the website said, "We are not scared of any attacks from China. The website is up and running and will continue to do so, no matter what. Our motives are clear. We want to unite our community."